Lucifer continues with the supreme being dysfunctional family angle as God sends an Angel to collect on Lucifer’s failure to live up to his end of the bargain. This review is very late, so late that there’s almost no point posting it considering how close the next episode is to airing but I’ve pledged to review every episode of this season and I’ll continue to do that even if only one person happens to read it. The previous episode ended on the suggestion that higher powers were gunning for Chloe to punish Lucifer for not delivering his mother to hell and this episode picks up on that idea immediately by showing that Chloe’s accident was anything but. 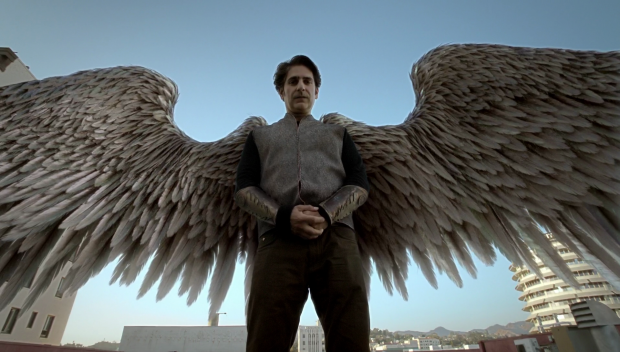 It was actually engineered by Lucifer and Amenadiel’s brother Uriel (Michael Imperioli). It has been established previously that Angels can’t harm humans because God decided that when creating them. This isn’t forgotten about and is directly addressed through Amenadiel telling Lucifer that Uriel can manipulate things to indirectly cause an accident. To use a cartoonish example it’s like luring someone with a trail of money before dropping an anvil on them. That doesn’t happen here but it’s the general idea. Addressing this ensures that Lucifer doesn’t ignore the threat that Uriel represents to Chloe. Before he thought that he couldn’t touch her but his demeanour changes when he realises that he is a very real threat and causes him to take the situation more seriously than he had been. This means that he follows Chloe around and becomes her personal bodyguard. Chloe is all set to ignore the threat as she doesn’t consider it to be real. As far as she’s concerned Lucifer is delusional so the fact that divine forces might want her dead is bizarre to her. Despite this she has a defined arc over the episode that results in her finally admitting that she is in denial and is actually terrified of what might happen to her. From her point of view she doesn’t want to leave Trixie without a mother and really doesn’t want to not be there for her daughter. Chloe’s arc is a short one but it is meaningful and it allows Lauren German to add more layers to a character who comes across as one note much of the time. German’s performance always gives Chloe personality but the character as written is fairly bland. More moments like this will help to fix it as the show can’t continue to coast on their relationship. Uriel presents a really interesting threat as there is a lot of familial backstory to muddle through. Charlotte mentions that he was the outsider who was shunned by the other Angels and has developed a chip on his shoulder as a result. This is probably why he was chosen to undertake this mission as he is clearly starved for attention and validation while also having enough of a grudge against Lucifer and Amenadiel to have a personal stake in it. Michael Imperioli does a great job as Uriel. There’s an anger to his performance that has clearly been festering for a long time. He has been waiting for longer than we can imagine to have a chance to get back at his brothers and takes some enjoyment in it. Strip away all of the supreme being stuff and we basically have a brother who is jealous that he was never the favourite child and that’s interesting to watch. 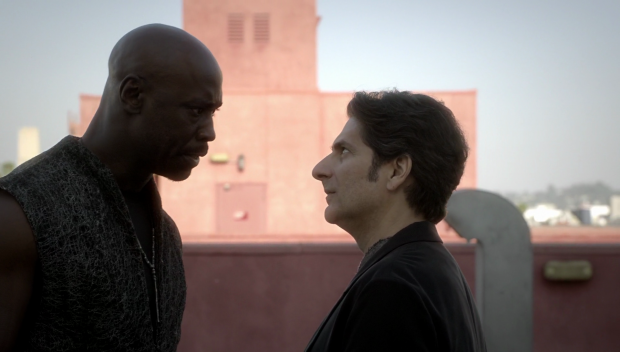 Lucifer encourages Amenadiel to square up against Uriel to dissuade him from carrying out the mission. It’s mentioned that Amenadiel was the toughest and most intimidating brother so Uriel might be scared away without much effort. Amenadiel’s attempt is a great scene as it shows exactly what Lucifer means. D.B. Woodside dials up the anger to maximum levels and gets right in Uriel’s face about how inferior he is when compared to him. Amenadiel towers over him and D.B. Woodside’s line delivery is best described as Biblical. Uriel’s reversal on the situation when he realises that his brother is all talk is brilliant as well. 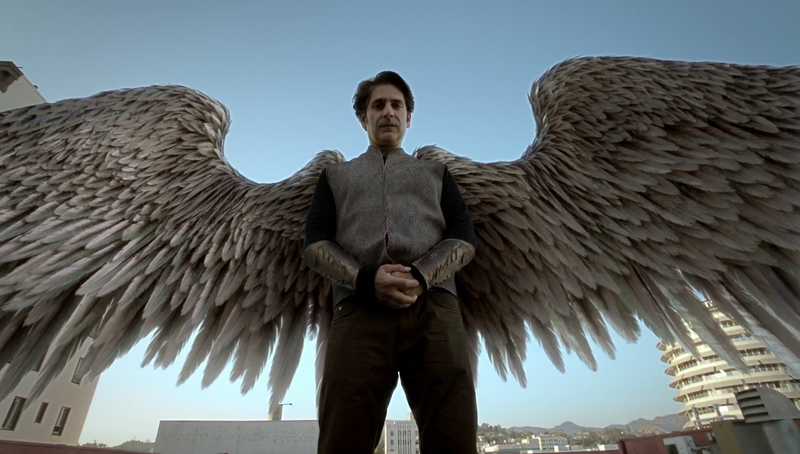 The shot of Uriel towering over his brother proudly presents his wings is a powerful moment and a startling reminder of everything Amenadiel is lost. He sees everything he used to be and it causes him to feel pathetic. He finally admits to Lucifer that he has lost his powers and Lucifer is less than sympathetic. I can see why for a couple of reasons. For one thing he has other things on his mind and he’s nothing if not consistently selfish. For another he believes that Amenadiel is better off removed from all of this and might have a happier existence as a mortal. I imagine there’s more work to do on this but it works for the purposes of this episode. This also allows for some suggestions of what might be causing Amenadiel to lose his powers. He attributes it to his long list of sins such as resurrecting a human to do his bidding, sleeping with a demon and working with Lucifer. Whether these are the reasons I couldn’t say but I wouldn’t be surprised if the real answer will be important at some point. 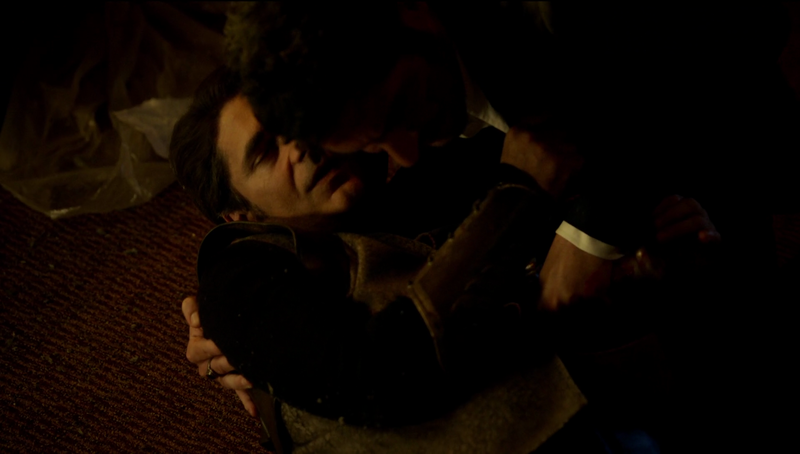 Lucifer’s final confrontation with his brother is great as well. It’s not often Lucifer will get his hands dirty but in this case he feels that there’s no other way. He has never been a fighter and Uriel proves to be much better than him. Maze does a better job against him but even she is no match for him in the end. The fact that it takes place in a run down church is great symbolism that adds to the Biblical subtext. Having the fight end with Lucifer killing Uriel says a lot about his current mindset. He is basically admitting that he has chosen Chloe as well as humanity over his family while also siding with his mother against his father. These are all huge and character defining and the episode doesn’t sugarcoat this in any way. Uriel’s death is played out for being the personal tragedy it is and will likely have far reaching consequences for Lucifer and Amenadiel. The final scene where Charlotte comforts the near catatonic Lucifer after he has killed his brother is very poignant and shows how much Charlotte cares for her children. Charlotte’s love for her children has never been in doubt. She definitely has some other agenda but she seems to genuinely care about her family and doesn’t want to see them come to harm. She even offers to go back to Hell to spare Lucifer and Amenadiel any other problems. Tricia Helfer has such good chemistry with Tom Ellis and D.B. Woodside that the family dynamic can’t help but come across strongly. Uriel’s suggestion that her plan is to eventually make her way back to Heaven, get God to forgive him before betraying him is an interesting idea and would fit with her alternative agenda. Betraying God doesn’t mean that she doesn’t care about her children and could actually be twisted into her doing it for them. It’s also possible that God isn’t someone who should be kept around. There are many possibilities and I find myself interested in them. As always, the case of the week wasn’t that compelling but it was better than most. Lucifer’s admiration of the victim as one of his favourite action heroes provided some entertainment and allowed the show to explore the reasons that Lucifer could never be one of those traditional action heroes. He really can’t deliver an intimidating catchphrase and is dispatched fairly quickly when fighting Uriel. It’s a shame that the case of the week wasn’t more interesting as there was such a great guest cast. Charisma Carpenter, Mark Dacascos and Phil LaMarr could have helped carry something much better than this. The basic foil of this one is the stupidity of those involved and it feels a little cheap when all is said and done. There was also an opportunity to have fun with action movie tropes that is barely taken advantage of. A great episode that really dials up the dysfunctional family drama. Uriel is an interesting character with a fascinating backstory that is very well explored. Lucifer killing him is important as it’s a powerful statement that he has picked Chloe, humanity and his mother over the rest of his family and wishes of his father. It’s powerful stuff and the performances sell that wonderfully. The case of the week is somewhat lacking despite some excellent guest stars but it provides some entertainment nonetheless.